There’s no way that I’m biased. Though Timberloch Lodge in New Hampshire closely resembles a Weir family heirloom, it’s much more than just a dusty old diamond hidden away in an attic. It’s a place that my grandmother has nourished and cared for since 1964, and will continue to do so until the fat lady sings. 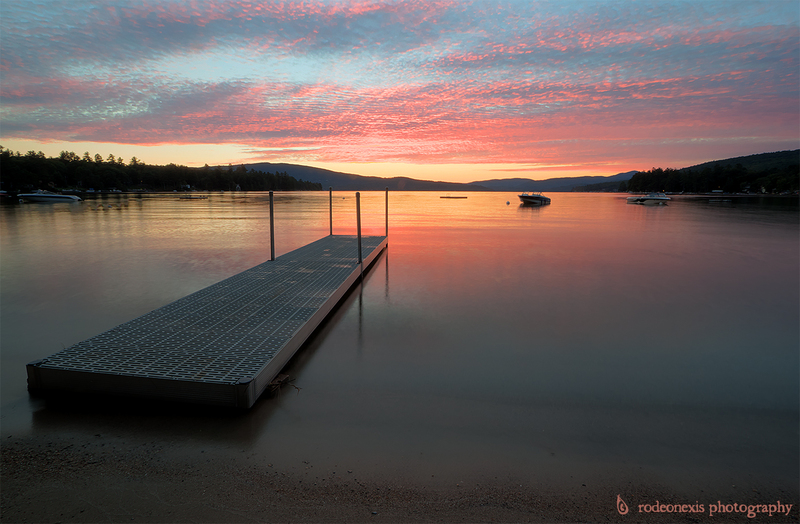 Sunset at the foot of Pasquaney Bay, Newfound Lake, NH. Okay, so maybe I am a little bias, but it’s hard not to be when you get to experience sunsets like this every weekend throughout the summer months. Sometimes I even go for a kayak or simply a swim as the sun’s dying rays fall with their last bit of vibrance. With that said, it might be easier if you check it out for yourself. If you find yourself in the Lakes Region of New Hampshire any time soon, why not stop in to say hello? Or just visit us at www.timberloch.com, or at our Facebook page. Hope to see you soon! I’ve been going up there since your Mom bought the place (it was the first year for both of us), but my family started going up there long before she bought it. It’s one of the best places on the planet and I look forward to going up every year and watching the sun set every night. Judging by the fact that everyone comes down to the beach every night to do the same thing, we are not alone in our thinking. Make that your Grandmother, not Mom.